Webster Community Sports Arena Complex is a volunteer-supported, nonprofit indoor ice arena/recreational facility, opened in 1999, that serves community members from Webster, New York, and the surrounding areas. The facility is located on Publishers Parkway near Rt. 104 and Five Mile Line Road in Webster, NY. The complex offers a fun, tobacco, drug and alcohol-free environment where children and their families participate in a variety of ice skating and hockey programs. The Webster Ice Arena has a mission to provide, promote and supervise a safe, non-profit ice arena in the Town of Webster. We promote interest in and opportunities for members of the public to engage in recreation, athletics, sport and other activities including ice skating, hockey, figure skating, and other recreational activities. 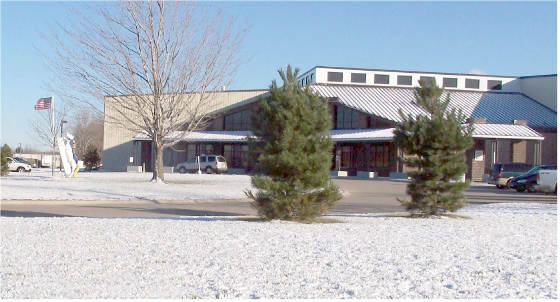 The community complex was established in 1997, and the original ice arena was built on land donated by William Boulter of Boulter Rigging Corporation. A portion of facility construction was funded by a grant from New York state with the help of state Senator Michael Nozzolio, with the balance coming from fundraising efforts, and is sustained by operating revenue. The rink was completed and opened to the public in 1999. Learn to skate programs The Webster Skating School. These programs offer recreational, competitive, and instructional opportunities that encourage a healthy lifestyle and overall well-being for community members of all ages. Our current fundraising activities, including the sale of a cookbook, an Amerk Alumni game and Silent Auction, memorial brick sales and other opportunities, are part of our long term effort to expand the complex to include a second rink. A 2nd rink will allow expansion of all current programs, will provide ice time for two additional high school hockey teams, a larger adult and spring time hockey league, and supplemental learn to skate programs. Furthermore, the new rink will make room for a more expansive recreational program offering including in-line roller blading, and broomball between March and October when the ice is off. We believe that this project is a productive and beneficial asset to our community, and that Webster Ice Arena improves the quality of life for community members of all ages. The Webster Ice Arena provides opportunities and activities for youth to become healthy, physically fit adults. The arena also hosts activities that help adults remain active, and it is a hub for events for all community members.